TERMINAL 6: The Portland facility is trying to build container business. A financially sustainable Portland terminal will require revenue from a diverse mix of cargo uses to support container. Portland’s geography and industry consolidation pose challenges to recovery of weekly transpacific container service. Portland seeks carriers providing Asia service to the region’s primary export and import markets. The Port of Portland Commission was presented with the findings of a consultant study and work from an industry leader committee to create a sustainable business model for container shipping at Terminal 6. The Oregon port is committed to achieving its mission by giving regional shippers a variety of options for moving their goods, including direct container service, air freight, barge and rail. This study focused on the container service aspect of shipping at T-6. The consultant concluded the most viable T-6 business model is a multi-use terminal that dedicates revenues from other terminal activities to support container service. Given that container volumes are lower than most West Coast ports, a financially sustainable terminal will require revenue from a diverse mix of cargo uses to support the container business. The study acknowledges that Portland’s geography as a river port and marine industry consolidation pose challenges to recovery of weekly transpacific container service. Key to the container facility’s success, the study found, is attracting carriers providing service to Asia that serve the region’s primary export and import markets, along with maintaining competitive terminal rates, keeping labor productivity levels at or above West Coast standards, reducing costs, and securing container volume support from the shipping community. 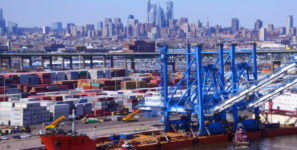 As a part of the study, the port convened an industry leader committee comprised of 23 members with diverse representation including exporters, importers, service providers, carriers, ports, labor (IBEW and ILWU), and legislators with strong shipper interests to provide industry knowledge and guidance to the port on the T-6 container business study. The port recently announced two new options for shippers. A rail shuttle from T-6 now offers a new way to move containers to and from Puget Sound ports for loading onto ocean bound vessels. The shuttle, in partnership with BNSF Railway, operates five days a week. Swire Shipping now calls on T-6 on a monthly basis, providing general cargo/container service to New Zealand/Australia and Asia. The Port of Portland lost almost all of much of its container business in 2015 when Hanjin, the South Korean carrier that went bankrupt in 2016 and which once supplied upwards of 75 percent of the port’s container business, pulled out. Hapag Lloyd also withdrew its business from Portland in 2015. Few containerships have called the port since, until the Swire service was initiated in November 2017.